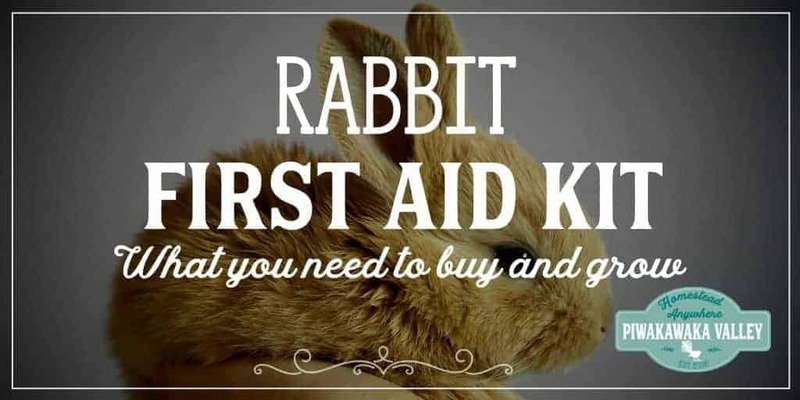 Having a rabbit first aid kit set up and in a cupboard ready to go reduces a lot of stress when you are dealing with a sick or injured animal as everything you need is there together. I suggest you assemble these things and create a kit and keep it somewhere handy. This isn’t just a rabbit first aid kit, you can use these things for most animal situations, and humans too. While I endorse the use of a vet when it is needed, there are something that either need attended to immediately, are simple to fix at home or just need sorted until slaughter time. There are sometimes times where there simply is no vet around to help. The advice and statements on this blog have not been evaluated by the Food & Drug Administration. I am not a doctor nor a vet – any information on this blog is not intended to diagnose, treat, cure, or prevent any disease. As always please run things past your health professional first. Antiseptic Hand Soap or alcohol gel : For washing hands before and after procedures/handling sick animals. If you don’t have this a good scrub with soap and water and a dousing of disinfectant will suffice. Baby Food: Keep a can of pure pumpkin or fruit baby puree on hand for helping feed sick rabbits or convincing them to take their medicine. Baby bottom balm/skin salve: Get a plain, non-zinc based product. Use on scrapes and rashes to keep air and infection out and to keep the wound bed moist to aid healing. Bandages: A selection of gauze, medical tape and crepe bandages. If you can get your hands on some vet bandages that are stretchy but stick to themselves is helpful, they stay on longer. Bromelain: Also papaya tablets or pineapple juice. Helps to dissolve hairballs. Don’t give in situations where gut stasis has set in, use every other day as a preventative during moulting season. Colloidal Silver: is a powerful, natural antibiotic. It is the most usable form of the most effective disease, germ, virus and fungal killers known. Colloidal Silver has been found to be both a remedy and a prevention for colds, flu, all infections and all fermentation due to any bacteria, fungus or virus, especially staph, and strep, which are often found in disease conditions. Also, it has been reported to rapidly subdue inflammation and promote faster healing. Cotton Balls/ Cotton Swabs/Gauze: For wiping/cleaning wounds or eyes. Flea Comb: For obvious reasons. Heat Pads: Useful to heat cold babies or adults who have been chilled or are in shock. Wrap in a towel before use. Can use a hot water bottle filled with hot not boiling water. Honey: Is an antibacterial, antiviral and antifungal and can be applied topically to wounds to aid healing. It can be mixed with water to give weak animals some energy. Infant Gas Drops: Can be given at first suspicion of bloat. Iodine: Can be used to wipe around wounds/abscess before treatment/lancing. Can be diluted and used to flush wounds that appear infected. Mineral Oil/Baby Oil: Used to treat ear mites – Treat for the first 2 days than every other day for 14 days after this, 2 times a week for the next 2 weeks ear mites have a 28 day life cycle so you must treat up to the 28 days to make sure all the mites are killed. Nail Clippers: To trim nails and overgrown teeth. Pro-biotic: Helps encourage good bacteria, especially after antibiotics or during hand feeding. Pedialyte: To give dehydrated animals. Rubbing Alcohol: To sterilise scissors/tweezers etc. Saline: Sterile medical saline can be given subcutaneously to treat dehydration. Clean but non-sterile saline can be made with one cup of boiled water and 0.5 tsp of table salt. This can be used to wash eyes and wounds. Styptic Powder – to stop bleeding of the nails when they are cut too short – Not to be used on the skin. Can use Cornstarch. Superglue: To glue wounds closed instead of stitches. You may need to leave a small opening at the lower end of large injuries to allow the wound to drain, and you can flush saline through to keep it clean. Syringe: To administer oral medication or food/water. Can be used to flush wounds under pressure to remove debris/slough. Tea Tree Oil/melaleuca: A natural antifungal, antiviral, antibacterial – very strong, dilute before use. Add 1-2 drops to 1T honey and use a salve for wounds or fungal infections. Towels: Old towels to dry wet rabbits, wrap heat pads and help hold rabbits during treatment. Tweezers: To help remove bot flies, maggots, debris. Vinegar: To wash down cages as a mild steriliser. Can use diluted bleach or disinfect instead but this will need left to sit for a while then rinsed well as it is not safe for rabbits to eat. Herbal remedies are great to add to your rabbit’s diet to keep them healthy. They are also easy to grow or find in the wild. Keep them on hand in the garden, or dry them and add them to your rabbit first aid kit. Read more here about the uses of specific plants for certain ailments. Please Pin for later and share with your friends!